Adopted on May 10, 1999. The apple, Genus Malus, is the most popular state fruit, various varieties representing New York, West Virginia, Washington and perhaps Rhode Island and serving as the state flower of Michigan and Missouri. 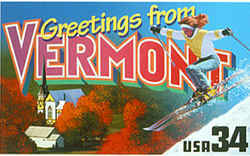 The apple was adopted as Vermont's state fruit on May 10, 1999. Whether you start with Adam and Eve or the Stone Age man in Europe, the apple has been around from the beginning. 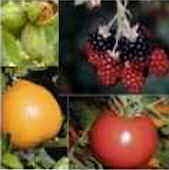 When the Romans conquered England around the first century B.C., they brought apple growing with them. William Tell shot an apple off his son's head at the order of Swiss invaders. The Pilgrims discovered crabapples when they arrived in the New World and as America was settled, nearly every farm grew apples. John Chapman, a.k.a. Johnny Appleseed, became famous for planting trees throughout Ohio, Indiana, and Illinois. 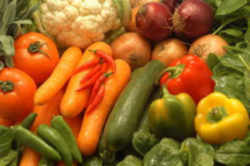 Today, over 650 varieties grow in the United States. They come in all shapes, sizes, shades and flavors and the best have become "household words"like McIntosh, Delicious, Empire, Rome, Spartan, Cortland and Granny Smith. What Vermont may lack in quantity as an apple-producing state, it makes up for in quality. Apples and apple products like applesauce, cider and hard cider are among the more important and cherished Vermont exports. 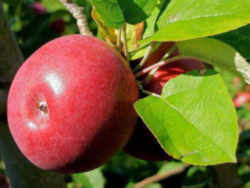 In fact, in 1999, the Vermont legislature designated the apple as the state fruit, and the apple pie as the state pie. The state has almost 4,000 acres of commercial apple production, most of it devoted to sustainable farming practices that respect the fruit and the land it's grown on. 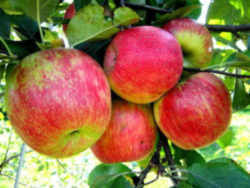 Vermont's leading varieties are McIntosh, Cortland, Red Delicious and Empire. McIntosh, Red Delicious, Macoun, Empire, Cortland... even the names are mouth-watering! By the bushel basket or the bag, or just an apple or two at a time, juicy, fresh apples - for pies, for cider, for apple crisp and homemade apple sauce, or for a healthy snack - are the best thing about autumn in Vermont. The apple most abundant in Vermont orchards is the famous, flavorful "Mac"- the McIntosh - which account for almost 70 percent of the apples grown in the state. No. 15 of the Acts of 1999, effective May 10, 1999, designated the apple pie as the official State Pie and the apple as the official State Fruit. When serving apple pie in Vermont, a "good faith" effort shall be made to meet one or more of the following conditions: (a) with a glass of cold milk, (b) with a slice of cheddar cheese weighing a minimum of 1/2 ounce, (c) with a large scoop of vanilla ice cream. Vermont's fresh apple crop is valued at $10-12 million each year. Processed apple products, like cider, applesauce and hard cider bring an additional $10-12 million into the state each year. Vermont's leading apple varieties are McIntosh, Cortland, Red Delicious and Empire. 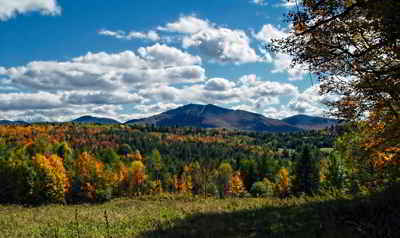 Vermont has almost 4,000 acres of commercial apple production. McIntosh apples became the state's leading variety after an extremely cold winter (1917-18) devastated most other varieties. On average, it costs Vermont's apple growers about $12 to produce, harvest, store and market one bushel of apples. In 1999, the Vermont legislature designated the apple as the state fruit, and the apple pie as the state pie. No. 15 of the Acts of 1999, effective May 10, 1999, designated the apple pie as the official State Pie and the apple as the official State Fruit. When serving apple pie in Vermont, a "good faith" effort shall be made to meet one or more of the following conditions: (a) with a glass of cold milk, (b) with a slice of cheddar cheese weighing a minimum of 1/2 ounce, (c) with a large scoop of vanilla ice cream.